Wool miraculously insulates, wicks, and resists bacteria, fire, static, and stains. The Medici built their empire on it, but we’re not up for raising sheep. Kim’s totally obsessed with natural fibers and the inherent nature of the materials that man tries to synthetically reproduce. Of course, that means Zach is getting bullied in to wearing wool instead of plastic based fleece and he got to thinking, wouldn’t it be cool if we could throw old sweaters, blankets and other wool products in to a machine and have it deconstruct the fibers into new material. Perhaps that’s through a hair relaxing and combing method, perhaps it’s through a felting process. Either way, wool has some impressive traits that are worth reconsidering. 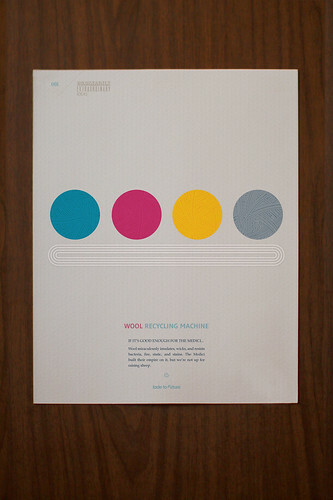 Tagged 11x14, 16x20, 8x10, art, cmyk, concept, cyan, extraordinary, glicee, Graphic Design, gray, idea, machine, magenta, medici, modern, ordinarily, poster, Print, recycler, recycling, wool, yellow. Bookmark the permalink.